©Dan Howe. All rights reserved. Stockbridge, MA, April 17, 2018—Norman Rockwell Museum will host a series of art workshops this summer with illustrator Dan Howe. A contemporary realist painter and teacher, Howe has been leading the ongoing Painting Like Rockwell narrated painting and drawing demonstrations, held on the first Saturday of the month in the Museum’s galleries. On Saturday, June 23, from 10 a.m. to 3 p.m.,Dan Howe returns to Norman Rockwell Museum to present a workshop on the art of portraiture. The artist, who has studied the techniques of the masters, will share the essentials of essential portraiture, from capturing facial structure and expression to the subtleties of light, shadow, hue, and skin tone. “My paintings attempt to render the subject as naturally as possible,” notes Howe. “My goal is to allow the painting to tell the subject’s story and not mine.” Participants will be painting from a live model, with a supply list provided, and all levels of art ability are welcome. Admission to the workshop costs $40; $30 for Museum members. Pre-registration is recommended by contacting the Museum at 413.931.2221 or register@nrm.org. 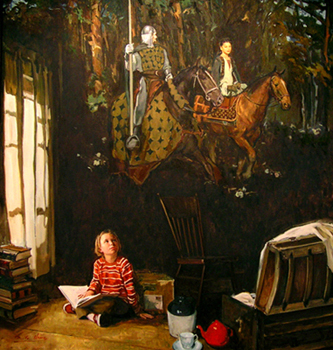 Norman Rockwell Museum will also present Painting Like Schoonover, Wyeth, and the Golden Age Masters of the Brandywine Valley, a weeklong art workshop with Dan Howe, from Monday, July 30 through Friday, August 3, from 10 a.m. to 4 p.m. Howe will share his rich knowledge of the approaches to drawing and painting that were used by America’s most prominent Brandywine River Valley illustrators, including Frank E. Schoonover and N.C. Wyeth, whose art will be on view at the Museum this summer. Light and shadow, color strategies, figure construction, and tone design will be discussed and demonstrated, as will direct painting from the model. The complexities of the process will be broken down in a series of exercises, and brought together in a final painting encompassing the elements of art. All levels of art ability are welcome. Admission to the weeklong workshop costs $250; $215 for Museum members and students. Pre-registration is required for the workshop by contacting the Museum at 413.931.2221 or register@nrm.org.